If nothing else, The Other Guys demonstrates how Will Ferrell can perpetuate his comedic film career. His character, NYPD desk-jockey Allen Gamble, is a milquetoast variant of Ferrell’s typical buffoonish man-child, sans the conflated pomposity and loutishness that fueled roles in Anchorman and (the overrated) Talladega Nights but had grown increasingly irksome in the lackluster Blades of Glory, Semi-Pro, and Step Brothers. To wit, Allen is a schmo who takes a job as a police forensic accountant and wiles away his days filing paperwork because it is the farthest thing from his previous job as a college campus pimp named “Gator.” He takes illogical pains to downplay the patent, stunning beauty of his physician wife (Eva Mendes). He drives a red Prius and cranks Little River Band to get his adventurous juices flowing. Allen and Terry soon set out to earn their piece of precinct cred by cracking an elaborate white-collar caper hatched by Wall St. jillionaire David Ershon (Steve Googan). Hamstringing them throughout is crippling social ineptitude, Terry’s active distain for his partner, and the stock irascible police captain (Michael Keaton), albeit one who moonlights as a manager at Ben Bath & Beyond and harbors an unwitting penchant for quoting lyrics from TLC songs. Yes, this is the buddy-cop spoof that Cop Out wanted to be. 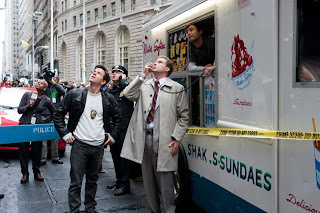 Director and longtime Ferrell collaborator Adam McKay knows how to strike just the right absurdist chord, blending a panoply of explosions and car crashes – and a gunfight that is a sly homage to John Woo – with scenes like an extended monologue in which Allen explains why tuna would win a war against lions (it’s as funny as it sounds). If Ferrell is playing partly against type, then Wahlberg falls headlong into it, riffing on his Oscar-nominated role from The Departed. And, there’s subtle satire in casting corporate villains instead of the stereotypical drugs-and-thugs sort, although the film unsuccessfully strains for import when it litters the closing credits with sundry real-life statistics about corporate greed and the widening wealth gap. The laffs wane towards the end of The Other Guys, devolving into a series of callbacks to earlier gags – the film could have easily been trimmed by about 15 minutes – that keep it from reaching rarified Naked Gun air. Ferrell and Co. work best when they leave the arena of parody and embrace the bizarre, like Ferrell and Mendes’s dinner-table crooning of a ballad named “Pimps Don’t Cry” or Allen plowing through crime scene cadavers, coating his Prius in a sheet of cocaine in the process. Mindless comedy is rarely this knowing.